The Museums of the Diocese of Peoria: Saint for the Future? World-renowned liturgical designer, Rolf Rohn, who serves as a member of the Sheen Foundation Board of Directors, helped to bring Bishop Jenky's vision to the drawing board. 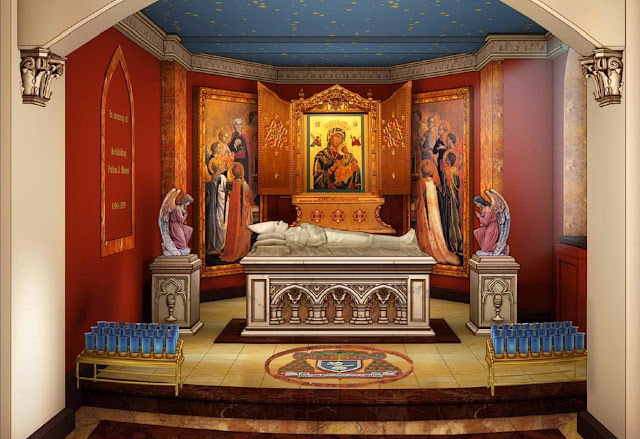 Presented here are sketches of dreams for how a potential Shrine could look in Sheen's home parish, the Cathedral of Saint Mary. The tomb would be located at the head of the Lady's Chapel, adjacent to the Sanctuary. Stained glass windows could help tell the story of Sheen's remarkable life. A large bronze statue capturing the famous meeting between Sheen and Blessed John Paul II would adorn a Rosary Garden on the Cathedral campus. An eventual "Sheen Experience Campus" could include a study center for priests, seminarians and missionaries, a retreat center, and an enhanced museum. Your prayers and support can help make these dreams a reality.